Season 3 of Daredevil gets off to an extremely promising start thanks to a renewed sense of focus and some streamlined storytelling. This binge review contains spoilers for Season 1 and 2 of Daredevil. 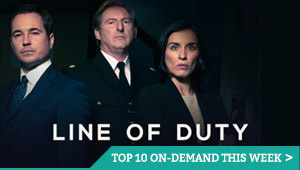 Catch up with our reviews of previous seasons here. Marvel’s Daredevil returns to Netflix for a third season that showcases a promising back-to-basics approach, after a messy second season that stumbled by attempting to juggle Elektra, the Punisher and all those pesky ninjas. 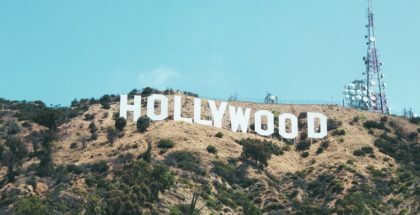 With a new showrunner in place (step forward, Erik Oleson), Season 3 seems to be on a mission to course correct and, on the strength of the first three episodes, everything is proceeding according to plan. 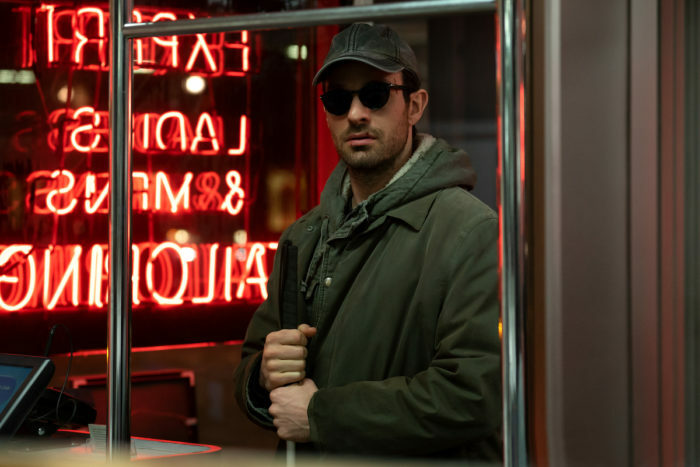 The series picks up where The Defenders left off (short version: everyone thinks Matt Murdock died in an explosion), with Matt (Charlie Cox) being nursed back to health by kindly nun Maggie (Joanne Whalley), who may have a closer connection to her charge than she’s letting on. Having lost Elektra, and with his powers on the fritz, Matt’s in a pretty dark place, declaring that he’d “rather die as the Devil than live as Matt Murdock”. Meanwhile, Matt’s nemesis, Wilson Fisk, aka The Kingpin. (Vincent D’Onofrio), wangles himself a deal with seemingly incorruptible FBI Agent Ray Nadeem (Jay Ali), whereby he’ll get to live outside the prison under permanent guard in a hotel, if he snitches on other crime gangs. All of which means that Matt finally gets his senses back and the first thing he hears is that Fisk is out of jail. Meanwhile, Foggy (Elden Henson) and Karen (Deborah Ann Woll) both learn that Matt’s alive and re-dedicate themselves to putting Fisk back behind bars, before he targets them for getting him indicted in the first place. There’s also a certain sharp-shooting FBI agent named Benjamin Poindexter (Wilson Bethel), who looks like he’ll probably be more important in a couple of episodes’ time. Based on the classic “Born Again” storyline from the comics, by writer Frank Miller and artist David Mazzucchelli, the season sets out its stall early by establishing that Matt is already completely broken as the story begins, not just physically, but emotionally and spiritually – his low point occurs in the first episode and it’s genuinely shocking. It seems likely then that his renewed battle with Fisk will result in his rebirth, even as Fisk, in turn, does everything he can to destroy him. To that end, there are plenty of warnings of the darkness to come, including someone addressing Matt with the line “Be careful that you don’t become the monster”. The most significant element of Season 3 is that appears to have taken the lessons of Season 2 to heart, finding a renewed sense of focus as a result. We still spend time with each of the main characters separately (Matt, Karen, Foggy, Fisk, Ray, Poindexter), but they’re all moving in the same direction, telling parts of the same story, the heart of which is Matt vs. Fisk. That streamlined storytelling makes a huge difference to the flow of the show, building momentum as the characters embark on their inevitable collision course. For long-term Marvel fans, there are some lovely nods to the comics to be excited about, chiefly the fact that Fisk finally gets to wear his famous white suit. The show cleverly teases this by having him appear in Matt’s head, taunting him while wearing the suit, before doubling down and having him wear it in the real life sections too. As with the previous seasons, the performances are exceptional. Cox’s performance is so exhaustingly physical that it’s often painful to watch, while D’Onofrio underplays to perfection, his character somehow all the more menacing for remaining calm and soft spoken. Woll and Henson continue their terrific work as Karen and Foggy and both are rewarded with expanded character backgrounds – we get to meet Foggy’s deli-owning family, for example. 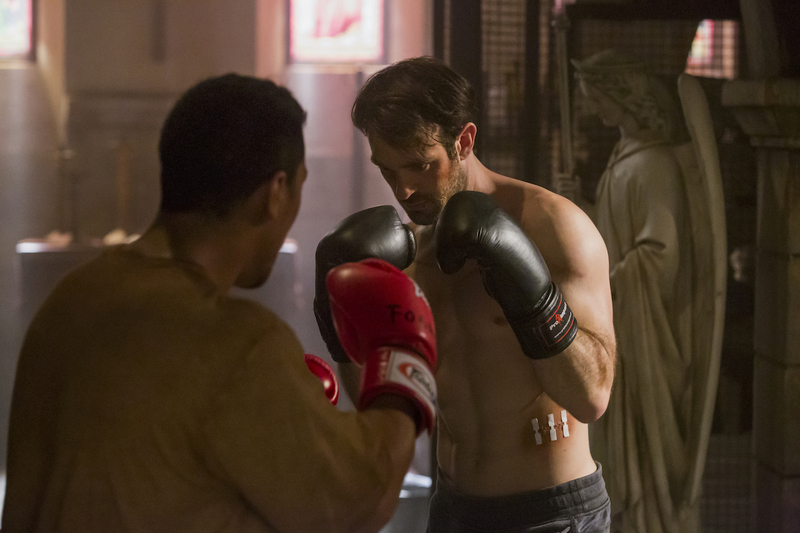 In terms of the action sequences and superheroics, there’s no sign of the Daredevil suit just yet and the first three episodes haven’t quite delivered anything on the level of Season 1 corridor fight (but, well, just wait till the fourth episode). On the strength of the first three episodes then, the third season of Daredevil is off to an extremely promising start, establishing a compelling central conflict with some intriguing new characters on the sidelines. Click here to read along with our binge-reviews of Daredevil Season 3.